Covering various foods with chocolate is a good idea in theory, but somehow, somewhere along the way, we've stumbled off the chocolate path and have gotten lost in the void. It's unclear how this started, or who first planted this evil seed, perhaps the French when they first started eating chocolate covered ants? However even the most depraved soul back in those early days could surely never have imagined the day when we'd be mixing chocolate with squid.... The situation has become dire indeed. 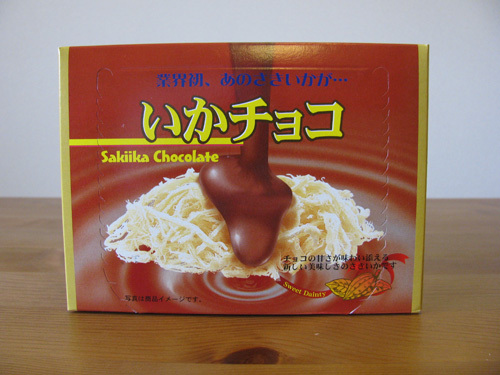 While not wildly popular, 'ika', as it's known in Japanese, is still a fairly widespread snack here, and you'll see it sold in most convenient stores and supermarkets. 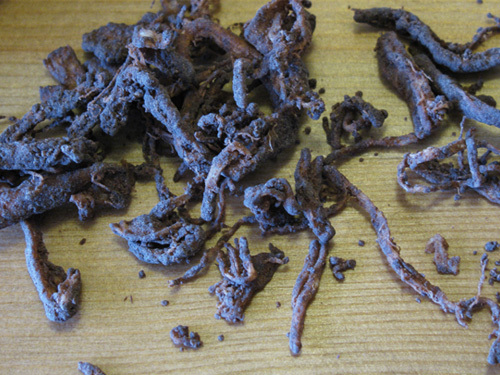 Don't get me wrong, there's nothing wrong with dried squid itself. While not exactly my favourite thing in the world, it does go fairly well with beer. I'm usually a fairly opened minded guy, but there comes a time when a line needs to be drawn. Would you eat a tuna and chocolate sandwich? How about some sushi with chocolate chips instead of wasabi? Didn't think so. Alright so maybe you think I'm being unfair. After all, I haven't even opened the package yet. Maybe it'll be a surprise hit like chocolate beer was! Never judge a book by it's cover right? Here we go! When I poured the contents of the package into my hand, I beheld one of the most miserable, horrid, and sickening sights I have ever had the displeasure to view. 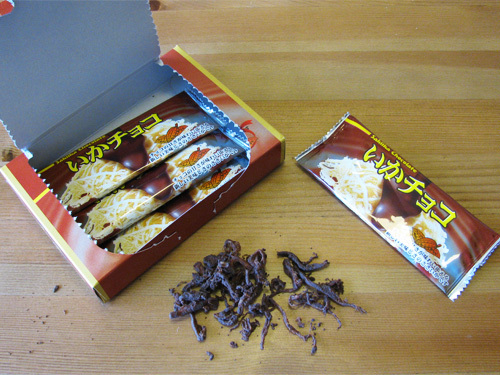 I figured, looking at the package picture, that the squid would come out in one piece, like a clump chocolate covered coconut, but instead it came out looking like a bunch of earthworms with a dusting of chocolate powder. These weren't the pleasant type of earthworms though, they were the dried, fishy, rubbery variety, the kind you don't serve to special guests. It's difficult to understand the mindset of the people responsible for launching a product like this. What did they think would happen? Certainly they couldn't have hoped to make any money. I mean, besides some obscure uses such as practical jokes, fertilizing your lawn, or killing your cat, it would appear to have absolutely no purpose in the observable universe. If the above picture isn't enough, and you really need confirmation as to how it tasted, well then I guess I can spell it out for you. A couple of pieces was enough to make me gag. in my taste test. I'm just a man after all, prone to fear like anyone else, and only able to take a certain amount of punishment.